James Monroe, 1758–1831. Fifth President of the United States, 1817–1825. Partially printed Document Signed, James Monroe, one page, 10” x 16”, April 9, 1822. Countersigned by Josiah Meigs, 1757–1822. This vellum document is exceptionally nice. Monroe signs to convey just over 69 acres of land in the Delaware District of Ohio to Charles Conlan. Conlan lived in Morrow County, Ohio, in central Ohio, where a note on the back shows that this grant was recorded in the land records in 1896. Born in Ireland, Conlan emigrated to the United States, married three times, and lived in Ohio until his death in Morrow County, at about age 83, in 1871. Present-day Delaware County lies between the state capital, Columbus, and Morrow County. Interestingly, a small printed notation at the bottom of this document shows that it was engraved and printed by W. I. Stone, who would engrave and print the now famous—and extremely valuable—copies of the Declaration of Independence at the request of then-Secretary of State John Quincy Adams in 1823. Monroe has signed with a large 4” black ink signature. His signature is dark, as is that of Joseph Meigs, the Commissioner of the General Land Office, who has countersigned in brown. The paper-and-wax seal of the General Land Office is intact. 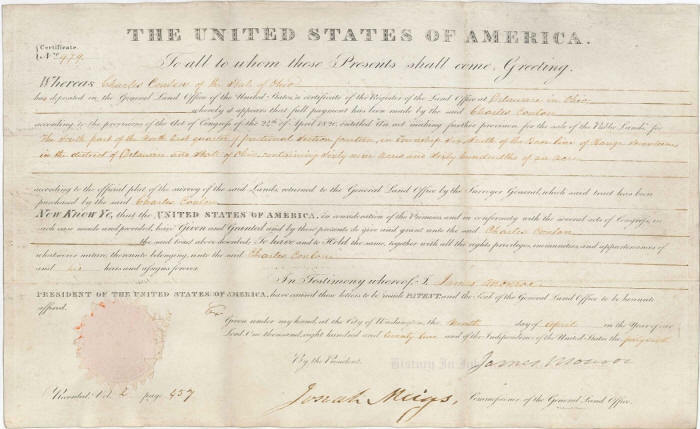 The document has normal folds, one of which barely touches the tip of the “J” in “James” in Monroe’s signature, and a microscopic pinhole affecting nothing. Unlike many of these documents, there are no breaks or holes where the folds intersect. There are recording notations and some soiling on the back, but the front of the document is clean and bright. The scans below do not do this document justice. We grade it fine to very fine. It would be beautiful framed for display. Unframed. Please ask us about custom framing this piece.